codeREADr, an NFC scanner app, enables reading NFC shelf labels so merchants can simply tap them to place restocking orders with their suppliers. 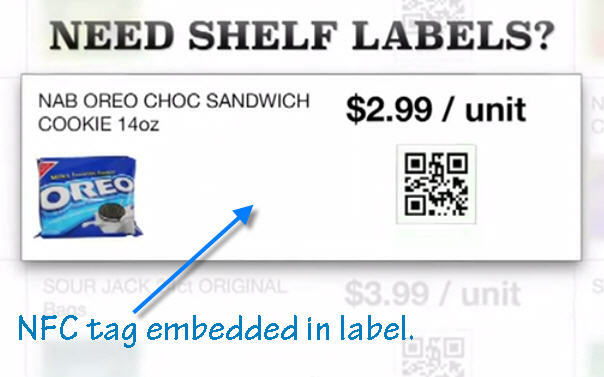 Embedding item IDs using NFC instead of barcodes frees up label space for merchants, suppliers, and brands to display interactive QR codes to engage consumers at the item level. Reading and processing of data embedded in Near Field Communications (NFC) shelf labels allows merchants to replace barcode shelf labels with NFC labels and simply tap them to order items from their supplier. When the NFC shelf label is tapped, the codeREADr app checks the embedded code against an on-device or online database. If the item is in the database, the app displays related information, such as item description, pricing, availability and (optionally) hot links for more information. The app user enters order quantities and, when done, uploads their order. ‘Merchants currently use codeREADr for Scan-to-Order services by either scanning the UPC/EAN code on the item or scanning a special barcode on the shelf label, often representing an internal item number,” said Rich Eicher, CEO of Skycore LLC. “It’s very cost effective but for clients who need to use barcodes on their shelf label, they lose valuable, consumer-facing real estate. With NFC shelf labels, however, the item’s ID is invisibly embedded in the label, freeing up room for a QR code on the label for the merchant or brand to engage and inform consumers at the item level,” Eicher added. The barcode app is available for iOS, Android and BlackBerry devices, however only codeREADr for Android is currently NFC enabled.